The edited volume Viking Worlds. 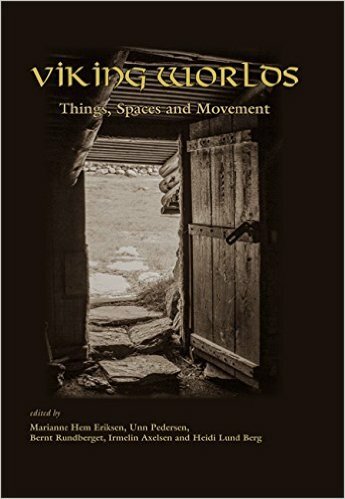 Things, spaces and movement was published by Oxbow in 2015. The book was the result of the international conference ‘Viking Worlds’ organized at the University of Oslo in 2013. A review of the publication can be found here. Fourteen papers explore a variety of inter-disciplinary approaches to understanding the Viking past, both in Scandinavia and in the Viking diaspora. Contributions employ both traditional inter- or multi-disciplinarian perspectives such as using historical sources, Icelandic sagas and Eddic poetry and also specialised methodologies and/or empirical studies, place-name research, the history of religion and technological advancements, such as isotope analysis. Together these generate new insights into the technology, social organisation and mentality of the worlds of the Vikings. Geographically, contributions range from Iceland through Scandinavia to the Continent. Scandinavian, British and Continental Viking scholars come together to challenge established truths, present new definitions and discuss old themes from new angles. Topics discussed include personal and communal identity; gender relations between people, artefacts, and places/spaces; rules and regulations within different social arenas; processes of production, trade and exchange, and transmission of knowledge within both past Viking-age societies and present-day research. Displaying thematic breadth as well as geographic and academic diversity, the articles may foreshadow up-and-coming themes for Viking Age research. Rooted in different traditions, using diverse methods and exploring eclectic material – Viking Worlds will provide the reader with a sense of current and forthcoming issues, debates and topics in Viking studies, and give insight into a new generation of ideas and approaches which will mark the years to come. 1. Marianne Hem Eriksen, Unn Pedersen, Bernt Rundberget, Irmelin Axelsen and Heidi Lund Berg: Exploring Viking Worlds.